In the wake of a carriage horse accident, we are reminded why animals should not be forced out of their natural habitat into an overcrowded, concrete jungle. On Ninth Avenue and West 57th Street in New York City, a carriage horse became startled at the sound of a honking horn and took off running, still attached to his carriage (with people in it), and crashed into a car. The impact dumped the carriage and its passengers onto the ground, and the driver unsuccessfully attempted to maneuver the horse. Thankfully, reports are saying this horrific accident did not cause serious injury. Forcing animals into doing something as unnatural as walking the streets of New York City should be considered animal cruelty. The horses being scared by the honking of a horn is a normal response as horses are generally nervous creatures, and tend to become frightened easily. There are many other humane options to keep the influx of revenue they receive from tourists aplenty. 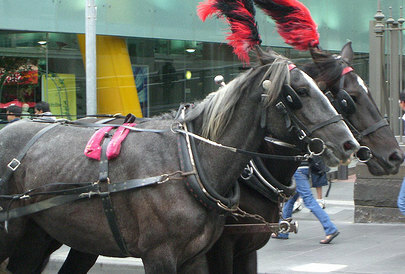 Forcing horses to pull a carriage through the crowded streets of New York should be illegal. How many more accidents and horse deaths have to occur for there to be a law put into effect? Please, if you haven’t already; take a moment to sign the petition that will ban carriage horses in New York City.